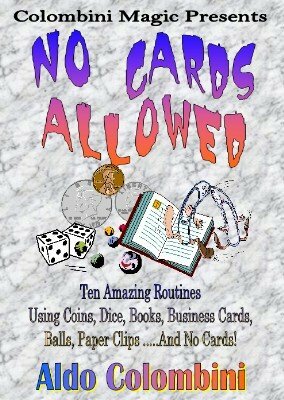 Ten amazing routines using coins, dice, books, business cards, balls, paper clips…and no cards! Special guest appearance by Cameron Francis (who performs his two routines). A HAND AND THREE COINS (Aldo Colombini): The two in the hand one in the pocket classic theme performed with three different coins and with a logical climax! TEA FOR TWO (Ken Brooke): Two cups, a coin box and several coins. After some comedy by-play, the coins magically move from under one cup to the other! LINKLIP (Ken de Courcy): A small clip mysteriously links to a bigger one in your hand. Clean, clever method! CONSECUTIVELY (Arthur Carter): A strong prediction using just three regular dice. You’ll love it! SNAPPY MATRIX (Aldo Colombini): The most direct matrix ever, where the coins assemble under one card and in a blink of an eye they re-appear under each card! IN PERPETUITY (William Zavis): A fun-to-do, fun-to-watch manipulation balls routine, for stage or close-up! CHINESE COIN MYSTERY (Joe Riding): A Chinese coin threaded on a ribbon changes places with a regular coin in the spectator’s pocket! A TWO-FISTED BOOK TEST (Karrell Fox): The easiest and the strongest book test ever! You’ll love it! THE MAGIC COIN (Cameron Francis): A spectator’s selected coin has a ‘wild’ effect on the other coins! THE UNFOLDING (Cameron Francis): A knockout business card transposition that you will use all the time!